He finished his career in 2010 ranked third in major league history with 12,839 putouts as a catcher (trailing only Iván Rodríguez and Jason Kendall), seventh in games caught with 1,938, and 10th in both range factor/game (7.12) and fielding percentage (.994). He also ranked first all-time among all Jewish major leaguers in career games played (1,971), fifth in hits (1,579), and eighth in runs batted in (607; directly behind Mike Lieberthal). He was inducted into the National Jewish Sports Hall of Fame in 2004. He worked in the Padres' front office as a special assistant from 2010 to 2013. On November 3, 2013, Ausmus became the 38th manager in the history of the Detroit Tigers, succeeding Jim Leyland. Ausmus' mother is Jewish, but he was not raised in the Jewish religion. Nonetheless, he still takes pride in his heritage. Ausmus stated in an interview with the Jewish Journal: "I wasn't raised with the Jewish religion, so in that sense I don't really have much feeling toward it. But, however, in the last 10 or so years, I have had quite a few young Jewish boys who will tell me that I am their favorite player or they love watching me play or they feel like baseball is a good fit for them because it worked for me or it worked for Shawn Green or other Jewish players at the major league level. It has been a sense of pride. If you can have a positive impact on a kid, I'm all for it." Ausmus and his wife, Liz, were married in 1995. They live in New Haven, Connecticut, and have two daughters, Sophie and Abigail. He graduated in 1991 with an A.B. in Government, and was a member of Chi Gamma Epsilon fraternity and the Sphinx Senior Society. While at Dartmouth, the lowest grade he received was a B. College graduates are uncommon in major league baseball, with only 26 players and managers with four-year degrees in 2009. In 2005, Ausmus became the first Ivy League catcher to play in the World Series since Dartmouth's Chief Meyers in 1916. Ausmus was also one of six Ivy Leaguers on major league rosters at the beginning of the 2009 season. In 2010, The Sporting News named him the ninth-smartest athlete in sports. Ausmus won the 2007 Darryl Kile Award "for integrity and courage", presented annually by local chapters of the Baseball Writers' Association of America (BBWAA) to players on the Astros and St. Louis Cardinals. In October 2007, Ausmus accepted a one-year, $2 million (plus incentives based on playing time) contract. The Astros planned for Ausmus to play on a part-time basis and mentor J. R. Towles, who would catch the majority of the games. Were Towles to struggle, however, the Astros were prepared to turn to Ausmus. "There's no question he can be a manager", Joe Torre said. "He's a smart cookie, everybody knows that, and he has an engaging personality." At the end of the season Torre had Ausmus manage the Dodgers for a game. Among active catchers with at least 600 games played, he finished the 2009 season ranked tied for fourth with a .994 career fielding percentage behind Mike Redmond (.996), Joe Mauer (.996), and A. J. Pierzynski (.995). On November 3, 2013, Ausmus was named the 38th manager in the history of the Detroit Tigers, succeeding Jim Leyland. In his first year as manager, Ausmus led the Detroit Tigers to a 90–72 record, winning the American League Central division title. The Tigers were ousted in that season's ALDS by the Baltimore Orioles, three games to none. 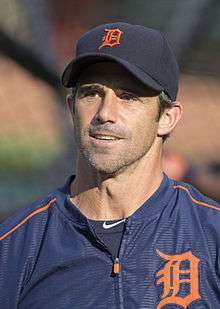 In his second year as manager, Ausmus led the Tigers to a disappointing 74–87 record, finishing in last place in their division. In his third season, Ausmus and the Tigers finished in second place in the AL Central division with an 86–75 record, 2.5 games out of the second postseason Wild Card spot. Shortly after the 2016 season concluded, the Tigers announced they would exercise the fourth year option on Ausmus' contract, keeping him as manager for the 2017 season. "I have had quite a few young Jewish boys who will tell me that I am their favorite player, or they love watching me play or they feel like baseball is a good fit for them because it worked for me, or it worked for Shawn Green or other Jewish players at the Major League level", said Ausmus. "It has been a sense of pride. If you can have a positive impact on a kid, I'm all for it." Ausmus, Brad (June 12, 2007). "You guys just can't get enough". ESPN The Magazine. 1 2 SportsJustice: Scrapiron speaks. I listen. Ausmus is funny.. January 27, 2007, Retrieved July 23, 2008. 1 2 Baseball Almanac: Darryl Kile Award. Retrieved July 23, 2008. 1 2 3 4 Corey Brock (November 16, 2010). "Padres hire Ausmus as special assistant". MLB.com. Retrieved November 22, 2010. ↑ "Brad Ausmus Statistics and History". Baseball-Reference.com. Retrieved November 18, 2010. 1 2 3 4 5 Peter S. Horvitz, Joachim Horvitz (2001). The Big Book of Jewish Baseball: An Illustrated Encyclopedia & Anecdotal History. SP Books. ISBN 1-56171-973-0. Retrieved March 16, 2010. ↑ Howard A. Megdal (January 22, 2009). "Brad Ausmus: Modern-Day Moe Berg". The Baseball Talmud. Retrieved March 16, 2010. 1 2 "Greenberg, Brad A., There's a new Jew in Dodger blue", Jewish Journal of Greater Los Angeles". Washington Jewish Week. July 1, 2009. Archived from the original on August 11, 2011. Retrieved March 18, 2010. 1 2 3 4 5 "Brad Ausmus Statistics and History". Baseball-Reference.com. Retrieved November 22, 2010. ↑ "Brad Ausmus named Tigers' next manager". Sporting News. November 2, 2013. Retrieved November 4, 2013. ↑ David J. Goldman (2006). Jewish Sports Stars: Athletic Heroes Past and Present. Kar-Ben Publishing. Retrieved August 23, 2011. ↑ Baseball Digest. Retrieved August 23, 2011. ↑ John Solomon (October 25, 1998). "Honoring, Yes, the Jewish Athlete". New York Times. Retrieved August 23, 2011. ↑ Greenberg, Brad A. (May 27, 2009). "The New Jew in Dodger Blue". Jewish Journal. Retrieved August 23, 2011. ↑ "Marriage Announcement 17 -- No Title". Boston Globe. June 16, 1963. ↑ "Three Wise Men". Sports Illustrated. June 5, 2006. Retrieved March 16, 2010. ↑ David Borges (July 22, 2012). "Brad Ausmus connects with Jewish roots as manager of Team Israel for the WBC". New Hampshire Register. Retrieved November 4, 2013. ↑ Gammons, Peter (September 29, 2001). "Apolitical blues". ESPN. Retrieved March 18, 2010. ↑ "Liz Ausmus- Detroit Tigers Brad Ausmus' Wife". ↑ Baseball Digest. Retrieved March 16, 2010. ↑ "Astro Ausmus Sky-High on Shot at Series". Record-Journal. October 21, 2005. Retrieved November 5, 2013. ↑ Bristol Press Archived September 28, 2007, at the Wayback Machine. 1 2 "SN names the 20 smartest athletes in sports". Sporting News. September 23, 2010. Archived from the original on May 23, 2013. Retrieved November 5, 2013. ↑ "Brad Ausmus". Baseball Library. Archived from the original on August 23, 2011. Retrieved August 23, 2011. ↑ Schlossberg, Dan (2007-04-01). Baseball Gold: Mining Nuggets from Our National Pastime. Triumph Books. p. 114. ISBN 9781623684747. Retrieved 5 May 2014. ↑ White, Paul (September 1, 2009). "Intelligence report: Baseball's whiz kids stand out, to a degree". USA Today. Retrieved November 4, 2013. ↑ "Ivy League Sports". Ivy League Sports. Archived from the original on August 14, 2007. Retrieved March 18, 2010. ↑ "Ivy League Sports". Ivy League Sports. Archived from the original on January 2, 2010. Retrieved March 16, 2010. ↑ "Retrosheet Boxscore: Chicago Cubs 8, San Diego Padres 6". Retrosheet.org. July 28, 1993. Retrieved March 18, 2010. ↑ "Late and close". Baseball Dictionary and Research Guide. Retrieved March 18, 2010. 1 2 Alyson Footer (October 30, 2007). "Major League Baseball News". Mlb.com. Retrieved October 7, 2010. ↑ Alyson Footer (April 16, 2008). "Why aren't catchers pitching coaches?". Mlb.com. Retrieved March 16, 2010. ↑ Fraley, Gerry (March 28, 2008). "Yanks' Girardi credits Colorado years : Rockies". The Rocky Mountain News. Archived from the original on November 21, 2008. Retrieved March 16, 2010. ↑ Alyson Footer (July 18, 2007). "Major League Baseball News". Mlb.com. Retrieved March 18, 2010. ↑ "Ausmus gets one-year, $2M deal to return to Astros". ESPN. October 30, 2007. Retrieved March 18, 2010. ↑ "Cleveland Sports". Cleveland.com. Retrieved August 23, 2011. ↑ "Astros send struggling catcher Towles down to minors". Houston Chronicle. June 6, 2008. Retrieved March 16, 2010. 1 2 "Ausmus extends career by catching on with Dodgers". Los Angeles Daily News. Archived from the original on May 23, 2011. Retrieved March 16, 2010. ↑ "Astros Notes: Moehler subs for Oswalt". Houston Chronicle. July 13, 2008. Retrieved March 16, 2010. ↑ "Astros Notes: Brother of pitcher Wolf umps game". Houston Chronicle. August 13, 2008. Retrieved March 16, 2010. ↑ "Astros Notes: Ausmus in last season with team". Houston Chronicle. August 20, 2008. Retrieved March 16, 2010. ↑ "Padres prune 40-man roster by five, cut loose Bard and Estes". SignOnSanDiego.com. October 6, 2008. Retrieved March 16, 2010. ↑ Alyson Footer (August 20, 2008). "Ausmus' time with Astros nearing end". mlb.com. Retrieved March 16, 2010. ↑ "Houston Astros vs. New York Mets". FOX Sports. Archived from the original on September 11, 2008. Retrieved March 16, 2010. ↑ "Dodgers agree to terms with Brad Ausmus on one-year contract". mlb.com. January 26, 2009. Retrieved March 16, 2010. 1 2 "Dodgers sign Brad Ausmus to one-year contract; Three-time Rawlings Gold Glove catcher to return to Los Angeles for his 18th Major League season". mlb.com. January 26, 2010. Retrieved March 18, 2010. ↑ "Brad Ausmus joins Padres Front Office" (Press release). MLB.com. November 16, 2010. Retrieved November 22, 2010. ↑ "Dodgers agree to terms with Brad Ausmus on one-year contract". MLB.com. January 26, 2009. Retrieved March 18, 2010. ↑ Padilla, Doug, "Dodgers catcher Ausmus is manager for a day" LA Daily News, October 5, 2009, accessed October 6, 2009 Archived September 27, 2011, at the Wayback Machine. ↑ "Brad Ausmus". Baseball-Reference.com. October 6, 2009. Retrieved March 18, 2010. 1 2 Ken Gurnick (January 26, 2010). "Ausmus comes to terms with Dodgers; Backstop agrees on one-year deal with option for 2011". MLB.com. Retrieved March 18, 2010. ↑ "Ausmus returns to Dodgers". ESPN. January 26, 2010. Retrieved March 18, 2010. ↑ "2010 National League Awards, All-Stars, & More Leaders". Baseball-Reference.com. Retrieved November 22, 2010. ↑ Ken Gurnick (April 10, 2010). "Back issue sends Ausmus to DL". mlb.com. Retrieved October 7, 2010. ↑ "Los Angeles Dodgers' Brad Ausmus at ease as manager". ESPN. October 2, 2010. Retrieved November 22, 2010. ↑ Sarah D. Morris (March 27, 2009). "Sarah's Take: Dodgers upgrade bench". MLB.com. Retrieved March 16, 2010. ↑ Making Airwaves: 60+ Years at Milo's ... Retrieved March 16, 2010. ↑ "SN names the 20 smartest athletes in sports". Sporting News. September 27, 2010. Archived from the original on May 23, 2013. 1 2 "SN names the 20 smartest athletes in sports". Sporting News. September 23, 2010. Archived from the original on May 23, 2013. Retrieved November 4, 2013. ↑ "A-Rod has time to turn it around". ESPN. February 15, 2009. Retrieved March 16, 2010. ↑ Footer, Alyson (March 24, 2008). "Ausmus to be emergency infielder". MLB.com. Retrieved March 16, 2010. ↑ "Astros summary: Cruz gets start". Houston Chronicle. April 4, 2008. Retrieved March 16, 2010. ↑ "Mariners | Another collapse for Mets in finale". Seattle Times. September 29, 2008. Archived from the original on May 24, 2011. Retrieved March 16, 2010. ↑ Martino, Andy (April 17, 2009). "Series preview: Brewers at Mets". New York Daily News. Archived from the original on April 20, 2009. Retrieved March 16, 2010. ↑ "Astute Ausmus Frames Future In Baseball". Courant.com. Archived from the original on July 18, 2009. Retrieved March 18, 2010. ↑ Schneider, Jerry (October 5, 2016). "Tigers exercise option to bring back manager Brad Ausmus". pba.com. Retrieved October 13, 2016. ↑ "Brad Ausmus". Baseball Reference. Sports Reference LLC. Retrieved October 5, 2015. ↑ Cling Cooper (February 23, 2013). "Faith Focus: Ex-Lookout stoked by Israel trip". timesfreepress.com. Retrieved March 14, 2013. ↑ "Israel invited to qualify for World Baseball Classic". JTA. June 2, 2011. Retrieved June 2, 2011. ↑ "World Baseball Classic: Israel, managed by Bra". Sporting News. May 21, 2012. Archived from the original on May 23, 2012. Retrieved March 14, 2013. ↑ Belson, Ken (June 1, 2011). [http://bats.blogs.nytimes.com/2011/06/01/israel-to-participate-in-2013-world-baseball-classic/#h[MLBIan] "Israel to Participate in 2013 World Baseball Classic"]. The New York Times. Retrieved July 16, 2011. ↑ Jeremy Fine. "Beginning of the Season MLB Headlines". The Great Rabbino. Retrieved July 16, 2011. ↑ Aaron Yellin (June 7, 2011). 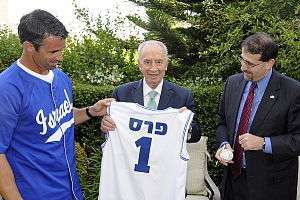 "Israel to Participate in 2013 World Baseball Classic". The Forward. Retrieved July 16, 2011. ↑ Sammy Hudes (July 12, 2010). "Jews to Play in Baseball All-Star Game". Shalom Life. Archived from the original on November 6, 2013. Retrieved November 4, 2013. ↑ Jorge Castillo (March 3, 2013). "Mets' Q-and-A with utility player Josh Satin". The Star-Ledger. Retrieved April 8, 2013. ↑ Corey Brock (October 25, 2012). "Padres prospect Freiman looks to raise his game; First baseman enjoys the competition in World Classic, Arizona Fall League". MLB.com. Retrieved March 12, 2013. ↑ "Astros select Fields, Freiman in Major League portion of Rule 5 Draft" (Press release). mlb.com. December 6, 2012. Retrieved March 12, 2013. ↑ "Jewish Sports Hall of Fame And Museum: Brad Ausmus". Jewishsports.org. Retrieved March 18, 2010. Ruttman, Larry (2013). "Brad Ausmus: Gold Glove Catcher". American Jews and America's Game: Voices of a Growing Legacy in Baseball. Lincoln, Nebraska and London, England: University of Nebraska Press. pp. 387–391. ISBN 978-0-8032-6475-5. This chapter in Ruttman's oral history, based on a February 29, 2008 interview with Ausmus conducted for the book, discusses Ausmus's American, Jewish, baseball, and life experiences from youth to the present.